(CNN) – The Arizona Republican Party censured longtime Sen. John McCain for what it called his “long and terrible” record of voting with liberal Democrats. The voice vote Saturday came from the floor at the party’s meeting in Tempe. While the resolution does not have an impact on McCain’s work in Congress, the party pledges it would not support, campaign for or endorse the Republican senator. Tim Sifert, communications director for the Arizona GOP, said 704 of the 1,658 committee members were present for the meeting. The resolution originally came from Timothy Schwartz, the party leader for a legislative district in the Phoenix area that has a lot of Democrats. By getting 20% of the members present to sign a petition supporting his resolution, he was able to get a vote on the floor. The resolution refers to McCain’s vote for the Senate comprehensive immigration bill last year, which included a pathway to citizenship. McCain, and his fellow senator from Arizona, Jeff Flake, were two out of 14 Republican senators who joined with Democrats to support the legislation last summer. While the state party’s resolution doesn’t mention specific legislation, it also refers to his procedural vote to move ahead with an amendment that would expand background checks to gun purchases at gun shows and online. McCain was one of four senators who bucked the GOP and sided with most Democrats on this issue. “The Arizona Republican leadership censures Senator McCain for his continued disservice to our State and Nation,” the resolution states. McCain’s office did not comment on the vote. First elected in 1986, McCain has long been known as centrist in the Senate. And while he’s worked with Democrats, McCain is one of the most outspoken critics of the Obama administration’s national security policies. He has especially been vocal about the handling of the deadly terrorist attack against the U.S. compound in Benghazi, Libya–an issue frequently raised by conservatives. Kyl said McCain, who’s in his fifth term, has been re-elected over the years despite opposition by many GOP activists. “Do these guys ever get elected? It’s John McCain who gets elected,” Kyl told the newspaper. In the past year, McCain has indeed reached across the aisle on legislation. He was part of the bipartisan group of 14 senators that crafted several proposals to end the government shutdown, much to the chagrin of far-right conservatives who only wanted to fund the government if the spending bill included major changes to Obamacare. As he gathered on the Senate floor in October to celebrate the end of the shutdown with his 13 cohorts, he gave no indication that he planned to stop working with some Democrats. "This group of 14 people (is) committed to staying together to address other issues of importance," McCain said. "This isn't the last crisis that we're going to go through. But I think we have the framework for the kind of bipartisanship that the American people need and want." Also that day, McCain chided the bickering and fighting that was taking place in the GOP. "There's a fight in our party, and that has to be waged and it's been there before," he said on CNN. But he was quick to remind his colleagues of former President Ronald Reagan's 11th Commandment. 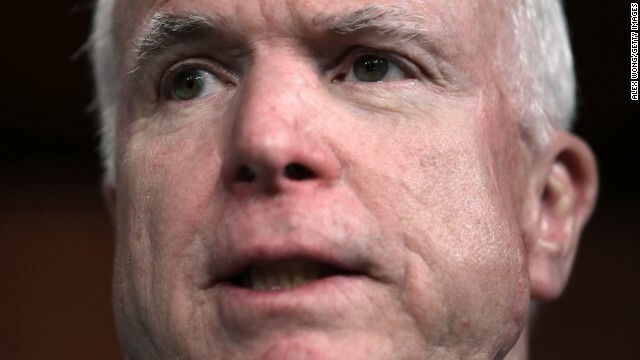 McCain, 77, hasn’t ruled out making a bid for a sixth term in 2016. He told NBC’s Jay Leno that he’s still “looking very seriously" at another campaign. The Arizona Republican easily held his seat in the 2010 election against Democrat challenger Rodney Glassman, but he faced a more challenging contest leading up to that in the GOP primary against former Rep. J.D. Hayworth. Hayworth accused McCain of not being a true conservative, driving McCain to move to the right on some issues. He was also forced to spend $20 million in the primary campaign. Sifert, who has been active in Arizona politics for more than 20 years, said Hayworth’s challenge, as well as a primary challenge in McCain’s 2004 re-election bid, are examples of some of the resistance the senator has seen from in his own party at home. BE IT FURTHER RESOLVED that until he consistently champions our Party’s Platform, we, the Republican leadership in Arizona will no longer support, campaign for or endorse John McCain as our U.S. Senator. How is that rebranding effort coming along? You're looking at it. Everything is proceeding according to plan. They're kicking out anyone who is "not one of us." Seriously, McCain has one of the most conservative voting records in the Senate by any measure. He was the GOP's choice for President just 5 years ago. This just demonstrates the insanity at play within the GOP today- and yes, the Arizona branch is plowing fresh fields of nuttiness. The GOP will lose every major national election if it keeps trying to appeal to an ever narrower band of radical crazy that lies at its base. Back in 2008, McCain (a moderate then) had my vote until he moved far right and onboarded Failin' Palin. That did it.. dumb move, much like AZ rebuking McCain for not being conservative enough. We NEED more moderates in Govt, from top to bottom. And what exactly does "not conservative enough" mean... must be in the small print on the back page of the GOP playbook. Haha. Staunch Absurdatives. Enjoying your creation, establishment GOPers? Reap, my fried, reap. I suspect "not being Conservative enough" means: that McCain does not support another attempt to take down the government, a la Cruz; that McCain does not support crashing the economy again, a la Cruz; and that he won't sign on the the GOP's newly threatened impeachment of the President (on God-knows what trumped up charges). It is pretty wierd when Mr. "bomb, bomb, bomb, bomb, bomb Iran" isn't fringey enough for the Republicans- even Arizona ones. Back in 2008, McCain (a moderate then) had my vote until he moved far right and onboarded Failin' Palin. That did it.. dumb move, much like AZ rebuking McCain for not being conservative enough. McCain had enough problems of his own. Remember, he was losing ground in the polls prior to Palin. McCain had demonstrated that the only thing that he knew was war. Remember when McCain wanted to put the campaigns on hold until the financial crisis was resolved? Do you remember that meeting McCain had wanted to have with the candidates and elected officials concerning the crisis? Do you remember how McCain had just sat there silently, with absolutely nothing to contribute. Never said much of anything besides, "Hello." That meeting is what sealed the deal for me, and confirmed that voting against the Republican was the correct choice. McCain, not stupid enough to be a conservative, and not bright enough to be a liberal.